Well where to start. I'm never good at this. This being writing a post, not the planning of a walk. It is the first time I've planned a walk that's not on an established route, like the West Highland Way or a real favourite of mine, climbing the Merrick from Glentrool. It all came about from talking to my Dad and some of the things we've done as young boys growing up in Ayrshire, Cumnock and being up at Dalblair and the Glenmuir. Camping, Fishing and tramping about. Talking about the ruins of the Castle at Kyle. Most people forget about that castle (I had), also the old bridge and the shell that is High Dalblair Farm. That's the furtherest I ever went but the road runs out there, right? Or so I thought. Bombshell from my Dad, that road goes to Crawfordjohn. It's an old road, really old and there's one from there that leads over to the Kames and Muirkirk. I knew about that one cause he'd walked and told me about but a road from Cumnock to Crawfordjohn. That was new. Well new to me. To me Crawfordjohn has always been one of those places that's miles away. If you ever have to drive to it from Cumnock is a long and winding loop of about 30 miles by car, either towards Muirkirk first then on to Crawfordjohn or down to Sanquhar and across. You see on signposts but don't go to. Now I'm intrigued that there was a road straight there. I started wondering if you the road was still there or parts of it, at the very least. So out came the maps and I can't see anything. Well that's not really true but the road ends at a sheep pen then there's no trail marked on the OS and a whole host of Forestry Commission roads but it looks possible to walk but impossible to walk the old road. Can't tell where it goes after the Glenmuir. I'm stumped and not sure what to do now. Like I said, I'm not a trailblazer, laying down new routes. Where do I start, how do I figure this out. I've got a few contacts on Twitter (Ah, good old Twitter I hear you moan). That like me, like the outdoors and love walking and one name that I've been following immediately springs to mind, @MrPhilTurner, Phil Turner. Phil runs a site http://lightweightoutdoors.com/ and also writes and takes photographs for @walkhighlands. The reason Phil sprang to mind was on his lightweightoutdoors site he has a sub category, The local adventure project and this seem to fit right in there and of course he is a very knowledgeable outdoors man. I ping him a tweet and then an email. Bascically asking for his advice and what did he think of this as route. I can't thank Phil enough, much to his credit, away he went and came back with a route. I was amazed and asked him how he came up with it. Now for some embarrassment on my behalf. Phil sent me a link. A link to this, The road to Crawfordjohn. Why the embarrassment you are asking? I work in I.T. and never though to Google, Cumnock to Crawfordjohn. School boy error there I think you might agree. It's a cracking wee post and details the old road nearly all the way. I never expect that much help from Phil and it's another example of how good the Twitter community is. Reproduced by permission of the Trustees of the National Library of Scotland. I managed to find a copy of the Andrew Armstrong map from 1775 on line at the National Library that is mentioned in the article. You can see where the old road ran from the map. Compared to the new Ordnance Survey map below you can see there is no longer a road. Reproduced by the permission of Ordnance Survey. 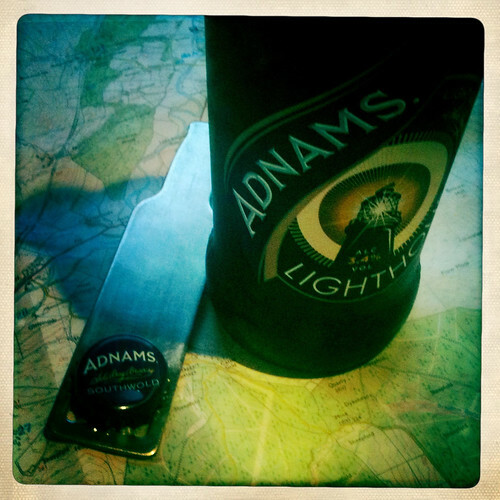 Now I've got a beer, my OS map and the laptop open and I'm looking at the route and there's much to get excited about. It looks a great walk on paper and the map is full of those little italics for old bits of history, interesting place names as well as couple of hills worth a trek up. I think that may well be a further post. It will be a further post. Speaking to my walking buddy for this one, he's not on twitter and doesn't have a blog so I can't link him up for you but he was all for banging out the 25 odd miles in a day. Start early but where's the fun in that? I'm all for an over-nighter, camping out under the stars, taking our time, talking plenty of photographs. Fun. I'm winning. I'm also thinking about grabbing a proper gps route while walking it. The .gpx file Phil sent is great but nothing beats boots on the ground. Lets face it nobody seems to walk this way any more and who knows some of you guys out there might be interested in the route and want to walk it yourself. This was meant to be a planning blog, don't think much planning went on, Phil did the hard work and I'm just reaping the glory. More like me waffling on. If there's anything you want to know leave a comment. I suppose all that's really left to do is set a date and get the boots on.